When I first started playing 40k in the early 90’s the Phoenix Lords were, at the time, the pinnacle of more or less everything. They were the crowning glory of Jes Goodwin’s Eldar range and comfortably among the most imposing and complex models made by Games Workshop. They had a sweet backstory and were the nuts on the gaming table. And, people were using the unconverted Pheonix Lord figures to win Golden Demon competitions validation of just how awesome they were. Later, when Apocalypse first came out, I was hugely taken with the Phoenix Court of Khaine, mostly as a modelling opportunity. What cooler formation to model and paint than all 6 Phoenix Lords, accompanying an Avatar? Even back then though I had started to go off some of those original Phoenix Lord models, the early excitement dulled by the test of time. Weren’t they all a bit two dimensional? Isn’t Feugan holding his axe a bit awkwardly? And what’s with Jain Zar’s hair?? At the time I didn’t think it would be possible to convert the Phoenix Lords given these are all metal, chunky sculpts with a lot of detail, with no obvious source of spare parts. Every time any type of Apocalyse game has been played or discussed at my club, I’ve fantasised about fielding the Phoenix Court. I don’t even know if they’re that good on the battlefield, but for me it’s always been about the chance to lavish tonnes of attention on 7 models – somewhat justifiably since the formation costs well over 1,000 points! This log tracks my progress converting the various Pheonix Lords, using a number of techniques to bring the models up to date. 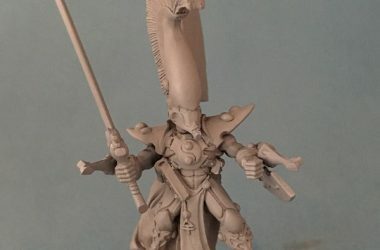 I should not that an important source of ideas – and the push to finally start this project – has been Andy Hicks’ Eldar army and it’s converted Phoenix Lords.